Tent camping is now allowed in Boulder City’s RV Recreational Zone after City Council unanimously approved a code amendment Tuesday, Oct. 23. Celia Shortt Goodyear/Boulder City Review City Councilman Kiernan McManus comments about the proposed library expansion during the council meeting Tuesday, Oct. 23. Michael Wells, owner of Canyon Trail RV Park, 1200 Industrial Road, requested the change because he wanted to offer tent camping at his facility and build three campsites. Community Development Director Michael Mays explained that the amendment would add tent camping to the existing amenities offered at the RV park and allowed within the zone. “Mr. Wells is planning to remove some uses and replace them with tents,” he said. 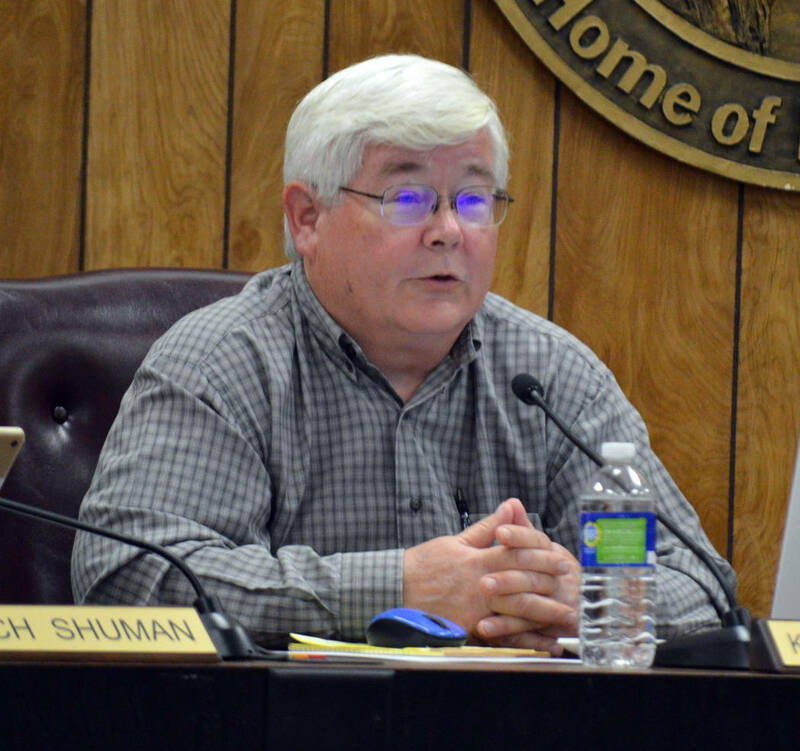 Councilman Kiernan McManus presented some changes to the initial amendment proposal, including limiting the length of time tent campers can stay at the RV park to 14 days in a 30-day period. McManus said that would still allow for return business during the busy season. “We’re not looking to have these people stay a long period of time,” Wells said. Wells also said most tent campers stay one night and allowing it wouldn’t help his business a lot. He wanted to provide them a nice place to camp rather than turning them away and referring them to a place outside of town as he’s had to do. Additionally, the tent sites need to be at least 500 square feet and 250 feet away from the restrooms. Wells said he had no problems with those requirements. “I appreciate you working with the city to make this available,” said Councilwoman Peggy Leavitt. She said she also appreciated work Boulder City Chamber of Commerce had done with Wells to bring this amendment forward. Councilman Warren Harhay complimented McManus for requesting the changes and said he agreed with them. The Planning Commission recommended council members approve the amendment during their September meeting. Also at Tuesday’s meeting, council approved a resolution taking a formal stance against Question No. 3 on the Nov. 6 ballot. Question No. 3 is an amendment to Article 1 of the Nevada Constitution that would require the retail energy market to be open and competitive by July 1, 2023. “I’ve not been able to get an answer from those supporting this about how it would affect our (energy) contracts,” McManus said. He also said those contracts are vital to the way Boulder City does business. “I really think this is not a good choice for Boulder City,” he said. “We’ve heard lots of detail about how this will hurt Boulder City,” he said. He said to protect the city’s ability to preserve those contracts it should oppose Question No. 3. Leavitt said she was concerned about the deregulation being a constitutional amendment because it would take a long time to fix it if it ended up not working. Harhay expressed concern about the Nevada Assembly coming up with energy policy if the amendment passes because it meant lobbyists would probably create it. “It’s a bunch of maybes being offered by this constitutional amendment,” he said. ■ Forwarded Silver Peak Solar’s request to lease 667 acres in the Eldorado Valley to the Planning Commission so it could be added to the land management plan. Council members expressed concern about the request because it was on part of the dry lake bed and they know that area is used for recreation. ■ Renewed the Federal Aviation Administration’s request for a 10-year extension on its land lease for an antenna facility on top of Red Mountain. Boulder City’s Contracts/Real Estate Manager Brok Armantrout said the contract runs from Oct. 1, 2017, through Sept. 30, 2027, and bring in approximately $473,000 in that time period. ■ Heard a presentation from Boulder City Library Director Kim Diehm about the proposed library expansion and bond question on the Nov. 6 ballot. ■ Approved changes to the audit review committee that would now make it a four person group with two council members and two members of the public. One of the noncouncil members would need to have experience in finance. ■ Appointed Bernard Paolini to the Civil Service Commission to replace Michael Hughes, whose term expires on Saturday.